One of the most important green manure crops is buckwheat (Fagopyrum esculentum), which is not a grain but a fast-growing, semi-succulent plant that produces nutritious triangular seeds. Buckwheat deserves frequent sowing in any garden because it attracts hoverflies and other beneficial insects, suppresses weeds, and adds bulk to the compost pile. Small plantings of garden buckwheat are surprisingly easy to handle, too. Buckwheat flowers attract honeybees and other pollinators with their morning nectar flow, but they also support healthy populations of smaller beneficial insects. Mounting evidence suggests that blooming buckwheat give a significant boost to important beneficial species, particularly hoverflies (properly known as Syrphid flies but commonly called hoverflies because of their seemingly effortless ability to hover). On both sides of the Atlantic, researchers are finding that growing buckwheat nearby can deter pests of potato, broccoli, green beans, and other vegetable crops, in part by providing abundant food for female hoverflies. Most hoverfly larvae are too small to see without a magnifying glass, but they are voracious predators of aphids and other small, soft-bodied insects. Organic growers who use buckwheat as a primary pest-prevention strategy have found that it’s important to grow buckwheat within about 20 feet (6 metres) of crop plants, which is easily done in a garden. Upright yet spindly, buckwheat plants have such shallow roots that they are easy to pull up with the flick of a wrist. A few buckwheat seeds sown among potatoes are known to confuse potential pests, and a broad band of buckwheat makes a fine beneficial backdrop for strawberries. Throughout the summer, I sow buckwheat in any spot bigger than a dinner plate that won’t be planted for a few weeks. With good weather, buckwheat can go from seed to bloom in a little over a month. Buckwheat’s fast germination makes it a top choice for smothering weeds. A few years ago, a section of my garden was home to a colony of field bindweed (Convolvulus arvensis), a formidable foe as weeds go. Field bindweed (often called creeping jenny) is a hardy perennial from Eurasia that winds itself around anything in its path and reproduces from root buds and seeds. But my field bindweed is now history thanks to a year of intensive cover cropping with buckwheat. Summer weeds that do germinate alongside buckwheat are usually shaded into submission. Later, when the plants are pulled out, residual compounds exuded by growing buckwheat roots may act as natural herbicides, suppressing the germination of weed seeds. Phosphorous and calcium are among the most important nutrients needed by plants. Soils that are regularly enriched with organic matter often contain an abundance of these nutrients, but in forms that are difficult for plants to take up. Buckwheat has been called a phosphorus pump because of its ability to take up soil phosphorus and return it in a more plant-friendly form. When you grow a patch of buckwheat, both your garden and your compost pile reap this reward. Domesticated in northwestern China more than 3,000 years ago, the cultivation of buckwheat gradually spread across Russia and northern Europe. Buckwheat grows best in warm weather, yet it matures quickly enough to make a crop in short season climates. You can begin planting buckwheat anytime after your last frost date. Buckwheat planted in late spring and early summer tends to grow taller than later sowings that grow when days are becoming shorter. I grow buckwheat to attract hoverflies and other beneficial insects and to add bulk to my compost, and I always pull up the plants before they pour their resources into developing mature seeds. A multitude of farm advisory bulletins warn that buckwheat can become weedy, but I don’t think this applies in an organic vegetable garden. In my garden, I welcome volunteer buckwheat plants, which are much easier to pull than weeds. Buckwheat seeds are sold by most seed companies that sell cover crop seeds, though your cheapest source may be a local farm supply store that sells buckwheat seed by the pound. At health food shops, check the sprouting seed section for whole, raw buckwheat groats, which have usually had their black hulls removed, yet are still strong germinators. The word "groat" means hulled seed, which are raw and sproutable in the case of buckwheat groats sold for sprouting. But take note: Toasted buckwheat groats sold as breakfast fare will never sprout, no matter what. "Wonderful article. Going to look into putting some buckwheat in my garden. Thanks." "Thanks so much - looks like what I need to get rid of my creeping jenny." "Yes, thank you for the article. I have corn, potatoes, green beans and broccoli started. I'll be on the lookout for some buckwheat for good measure." "Excellent info ! Thanks "
"It's impossible to underestimate the value of the information contained in articles like these: buckwheat as a "potassium pump" is an excellent example as I now know how to use this plant for my potassium-hungry plants for better fruiting. I can't wait for more installments! Thank you, Barbara, Jeremy, Bob and the GrowVeg community for some of the most informative pages on the 'web." "I was considering planting my field/garden with buckwheat this spring to get rid of weeds and help to break up the heavy clay. I was thinking I would let it flower and then cut it down before it went to seed. Would I just let it dry out for a week and then disk it under? Then what would I do with that area for the rest of the season? Can I do this over many times in one season or would I try something else when the buckwheat is done? " "Cheryl, in most climates you can sow buckwheat twice, back to back. Then, in late summer, plant oats or another cover crop that will be killed by winter cold. By spring you will have very garden-worthy soil." "Holy cow I bought creeping Jenny from my local nursery last year for an are needing ground cover. I'm going to yank it out now it hasn't hardly taken off and I had no idea it was more of a weed than desired plant. Why do they sell it?" "Rebecca, hold off or ripping out your new ground cover. Creeping Jenny also refers to what I call Moneywort (Lysimachia nummularia), which is commonlysold as a ground cover. It can also be a bit weedy, but it's not at all like field bindweed. Nurseries won't sell bindweed on purpose. " "Hi Barbara, As the author of some of those farmer bulletins, I can assure you that some organic gardeners do have trouble with buckwheat volunteers. You are right that the seedlings are very easy to kill, but they can suppress the crop that is coming up at the same time--particularly grasses and vine crops. Buckwheat can easily produce 10 times as much seed as you'd plant as a cover crop, so it is worth being alert to what it's doing. Fortunately, prevention of volunteers is easy. 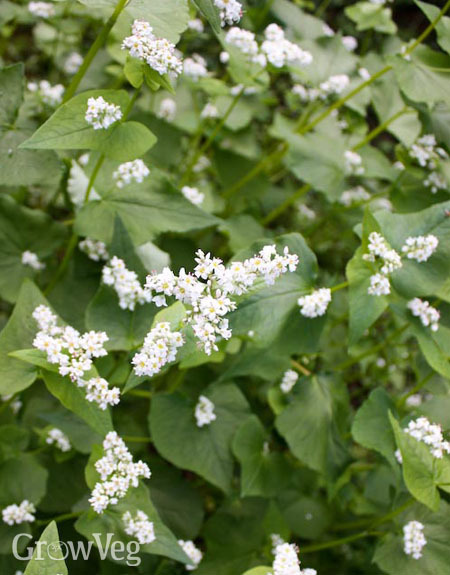 Turn in the buckwheat as soon as the plants turn white with flowers. That's typically 35 to 40 days after planting. If you need to hold the ground longer, replant more buckwheat right away. To use buckwheat as a forage for beneficial insects, plant buckwheat in borders and harvest it before seeds turn brown. For filling in between crops in the summer, it is hard to beat buckwheat as an easy and effective weed suppressor and soil mellower. Thanks for featuring it." "Turns out I've been coeliac all my life but I have been diagnosed with the disease only a year ago. Buckwheat has done me a lot of good. Great source of minerals and protein, and anti-oxidants." "I agree with Mr. Bjorkman. It's a perfect smother, soil enricher plant, but you need to pay close attention to what it's doing. Oh btw, if you have a stand of buckwheat, you may have to do your turning under at dusk. Bees like it too and can get very indignant at you turning under their food source! My DH had to make a run for the house initially! 2 of our neighbors keep bees and they were not happy about the tiller! The blooms were literally undulating with the bees working the flowers. It was amazing! " "Well I never knew one could grow buckwheat in England. The explanation was concise and not rambling (no pun intended) like many of the sites I have looked at to learn how to grow vegetables. Thank you for your excellent and reassuring information. And the added incentive - TO HOLD BACK THE WEEDS!!! WHAT A POTENTIAL SUCCESS STORY!" "Thanks for the tips and the advices. I would like to ask one question about buckwheat. I have planted buckwheat at 4 June 2012,(50 m2) for colecting the seeds. Now (27 June 2012), after 24 days, it is 15 to 20 cm in height and has allready startted to flowering. Is this normal? Because i read in articles that buckwheat is growing to 70-80 cm. Thanks in advance Giannis"
"Good observation! The height of the plants varies with the season and growing conditions. Right now I have plants that grew in cool spring weather in full bloom at 30 cm (10 in). Another sowing made a month ago is just starting to bloom at 70 cm (27 in), and it will go taller before it's finished. Keep planting to see how buckwheat behaves for you in the second half of the season. " "Barbara,I have searched high and low for how one DOES let Buckwheat finish seeding, and then how to harvest and DE-HULL.The vitamin/mineral/protein/rutin/flavones/antioxident profile of buckwheat-fruits is astonishingly dense and outdoes almost ANY other plant in your garden.I've figured out how to get down to clean seeds.But how to go about de-hulling on a home-scale is information hard to come by.Can you help? And wouldn't this plant, or red clover, solve the pollinator crisis in the vast monocrop-deserts of almond groves? Something for keeping the bees around while the almonds AREN'T blooming (which is most of the time)?" "My buckwheat is about 4 feet tall, and flowering in early August. Should I cut them down, and till in the stalks, or pull them up and compost them?" "It's your choice, George. This time of year, I like to pull out openings in a stand of buckwheat and use the sheltered spots for fall veggies, then pull and compost the rest of the plants after the new veggies start growing." "Thanks. I Have no fall veggies. after I pull or till the buckwheat, can you suggest a fall foliage crop to replace it? I'm in upstate NY, zone 4B. " "Oats will grow vigorously and then be killed by cold winter temperatures, so they are easy to turn under and don't delay spring planting. You also can try a winter cover crop blend that includes cereal rye and Austrian winter peas. The little plants survive winter and grow vigorously in early spring. Best for space that is not needed until early summer. " "Thanks for the info. I'll pull the buckwheat, then plant the fall cover crop." "Still hoping you'll answer my question (Kathryn Bastianon on Sunday, September 16, 2012) about how to EFFICIENTLY/ SKILLFULLY harvest the fruits of Buckwheat? Thanks! Kathryn B"
"Hi Kate, Dehulling by hand is without question the most difficult buckwheat preparation step to do on a small scale. Buckwheat processors have expensive specialized equipment for this purpose that can be difficult to replicate. What some folks have had success with is using a hand-cranked malt crusher (see barleycrusher.com for a photo). These are used by some home brewers who want to do every step themselves. First sieve the buckwheat so that you have separated the seeds into uniform sizes. Then adjust the rollers on the malt crusher to be just a hair smaller than the buckwheat kernels. If you feed the buckwheat through, the hulls should pop off most of the kernels without breaking the groats too badly. If you are making flour, you have more latitude. Third, sieve or blow to separate the hulls from the groats and flour. From a growing-your-own-food standpoint, using buckwheat does not seem worth it to me. It is a fantastic cover crop, as you mentioned. However, I'd invest my time in the garden growing vegetables instead because of the huge time investment and slight quality difference from store-bought buckwheat. You can read my fact sheet on buckwheat harvest at nmsp.cals.cornell.edu/publications/factsheets/factsheet51.pdf? or see pictures of the process at http://www.hort.cornell.edu/bjorkman/lab/buck/guide/buckwindrows.php Thomas"
"What an excellent answer! I agree that milling buckwheat at home is very difficult, but not hand-harvesting enough seeds for replanting in the garden. Note that whole seeds also can be sprouted in a clean growing medium and clipped off just above the soil line for eating or juicing. As the seedlings emerge, they leave the husk behind in the growing medium." "Wow! Thanks Thomas Bjorkman, Barbara Pleasant! Well, I think I'll go to a ceramics-studio nearby and pick up a couple of small round shelves made for firing pottery~ they're about 1" thick and fairly heavy. If I remember correctly, some have a hole at center, where I could place a dowel... I'll report back if I come up with something workable for milling. What did ancient peoples do, I wonder? Buckwheat has been a valuable, bountiful food down through the ages, so perhaps there's some anthropological record? With pictures? And instructions in Chaldean? I live where prices on Natural Foods are Outrageous, so mebbe I'll try doing it just for the h*ll of it! Thank you both, again. Kate Bastianon "
"My allotment neighbour has just sown buckwheat a few weeks ago, when can it be started as a green manure, and thanks for discussion on growing for eating - I was wondering whether to try that! " "It is quite late to be sowing buckwheat except in warm climates, because buckwheat needs warm soil. In fall, mustard and other leafy greens make more vigorous green manure crops." "It is a lush cover already, I just am not sure they will make seeds, but the top growth is working already to suppress weeds ( we did have a very hot spell in the last few weeks!)" "Great! When it stops growing you can chop it into the soil, or just let cold weather take down the stand. There is probably not enough warm weather left for the buckwheat plants to make mature seeds." "My cover crop of buckwheat plants are about 6-8 inches high and beginning to bloom. It will probably frost here in about 2 weeks. I was not planning on tilling until spring, but now I'm wondering if I should do it now. Thoughts?" "Cold weather will kill the buckwheat plants, so you can let nature do the work and simply wait until spring to till. The dead buckwheat plants will help hold the soil in place and prevent winter erosion." "Highly descriptive post, I loved that bit. Will there be a part 2?" "How many seeds does the buckwheat plant create?" "I have an area that I'm looking to put a grown cover that is good for Pollinators such as honey bees. The challenge is this area gets little to no direct sunlight. I was thinking about buckwheat or white dutch clover but can find information on whether it will grow without direct sunlight. Any thoughts or suggestions?" "Ed, most shade-tolerant ground covers are not heavy bloomers, but when they do bloom they are visited by pollinators. Some suggestions include celadine poppy, mondarda, dead nettle (Lamium)." "Can I grow buckwheat in South Florida? I planted swome buckwheat seeds from our local grocery store and planted in January, and they are doing great into July. Can I plant year around here? Any pest or take-over problems anticipated?" "John, at this point you know more than I do, but if your plants are growing okay, I guess you can plant more. South Florida is so unique that there could be pests, wait and see. Buckwheat is not invasive, though it does reseed a little bit. Good luck!" "Light soils and hot weather are common in South Florida, and bad for buckwheat. It will survive, but as a cover crop is will not be successful. University of Florida researchers have looked into this question in some detail, and found only a short spring and fall window in central Florida. The warm-season cover crop that is really looking great for Florida is a legume called sunn hemp. You can see the summary at their website http://edis.ifas.ufl.edu/ss461"
"can Buckwheat be planting near the runway at an airport?" "I can't think of a reason why buckwheat would cause runway problems. Interesting idea." "i am supprized that there is no mention of leftover tea to spray on roses etc to get rid of aphids ( greenfly ) etc, also leftover tobacco soaked in water, and strained, the liquid, is a good pest deterrent, best for borders, rather than on the actual plant "
"Can I sow buckwheat in a chaotic permaculture fashion right next to vegetables, let it flower and forget about it? I plan on laying a heavy mulch hay over everything as well. Wondering if there are particular vegetables that may not like this idea. Thinking spring sowing with my seedlings." "Gina, you can interplant buckwheat sparingly along the edges of potato or bean rows, but it grows so fast that it can shade out less exuberant vegetables. However, it is very easy to pull up, so you can thin it back to give other plants better access to light. Good luck!" "Another benefit - the flowers hold for days in a vase!" "Susan, thank you! I grow potatoes vertically in cages with co.post and straw, so they get quite tall and there would be no problem with buckwheat shading them. Right now my pole beans are over 12', so ditto. Thanks so much! Sounds like buckwheat is not aleopathic. " "I have buckwheat and its got -5 and its still Growing its snowed 3 times so its cold resistant in williams lake b.c. canada and its oct. And planted the seeds end of Aug."
"Its easy to grow good for beginers"
"When is best to plant your new seeds. We are growing in a greenhouse and want to use the new seeds as soon as possible." "Depends the where u are and the temp. The time to plant is when it gets above plus 5 and wont go below minus 2"